Valentine’s Day is another great holiday to celebrate with crafts! We always make Valentine’s Day cards every year. Some years we make a few for teachers or for friends that are not in the same school. In the past, making 40 Valentine’s cards seemed daunting but this year we are going to try. It helps that I am starting them now and not on February 12th or 13th like I normally do. Last year, we made filled Valentines for Pea’s preschool teachers and class. The preschool class was much smaller than her kindergarten class and did not need to have the children’s names on them. We bought Valentine’s cards for Pork Chop’s kindergarten class because there were more children in his class. The kindergarten and first grade teachers at our school send home a roster with each child’s name on it and asks that the children fill out the cards themselves. When you have a kindergartner writing their classmates’ names on cards, it’s a given that several of them will get “messed up” and your child will want to re-do them. Handmade (and hand-stitched like last year’s) cards take a lot of time but the store bought cards typically have a bunch in the box for $2.00. This year we decided that we still wanted to make Valentine’s Day cards. 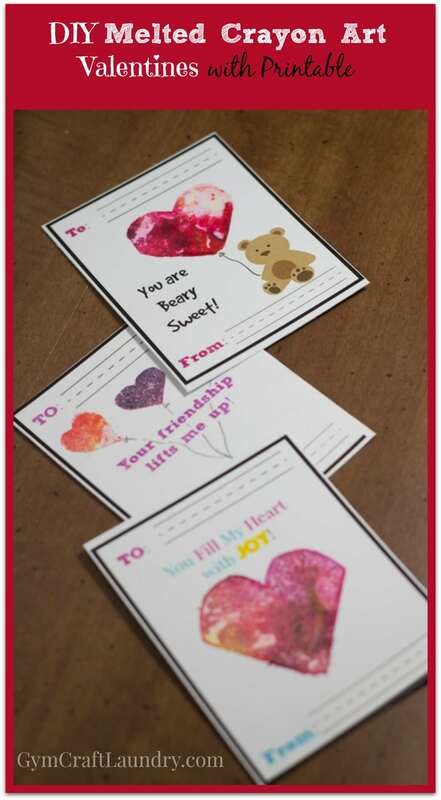 I also wanted the convenience of printed cards so I came up with this fun Valentine’s Day craft for my daughter’s class. 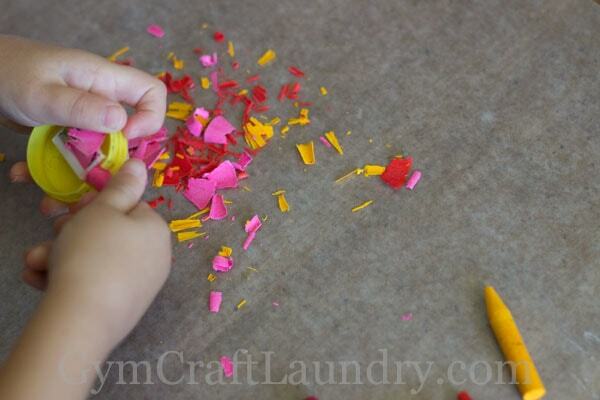 The “crafting” part is something young kids can help with but an adult or older child (and supervised) should do. Cut out the individual cards (6 to a page). Set aside. 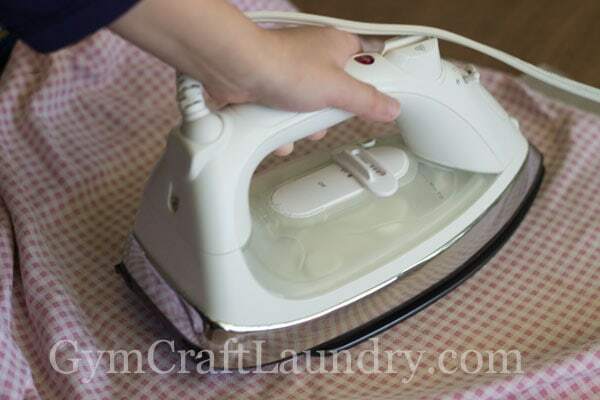 First I laid out a sheet paper towel on the table and put a sheet of wax paper on it. I had my kids use a manual pencil sharpener to “sharpen” broken crayons in coordinating colors. For these hearts we chose shades of pink and red with a tiny bit of purple and a few shavings of yellow. 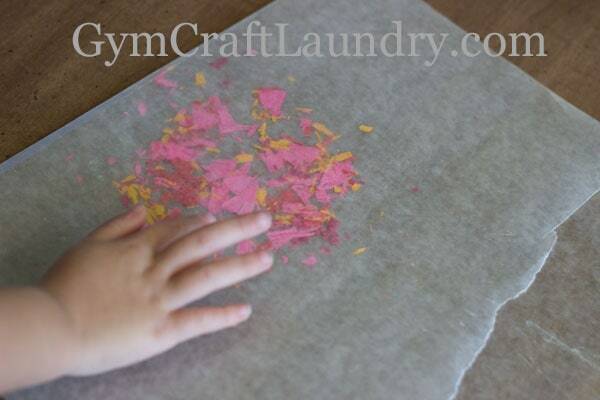 We collected the crayon shavings on the wax paper. Spread them into a thin layer. Next put another sheet of wax paper on top of the shavings (or you can fold the first wax sheet over the shavings) and cover it with the old kitchen towel. 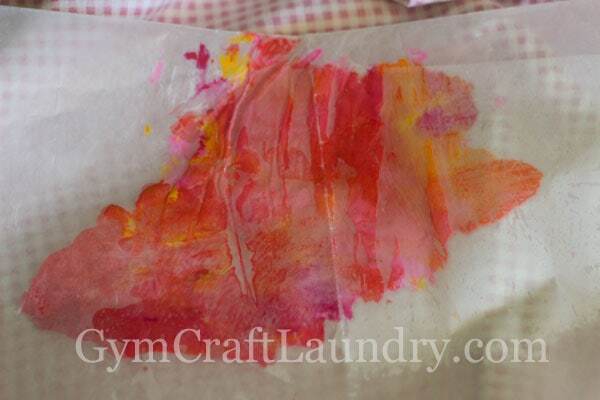 Carefully iron (dry, no steam) over the towel until the crayon is melted. It only takes a few seconds. My kids thought it was fun to watch the colors mix! The thinner the layer of crayon the better. Too thick of a layer causes the wax to leak out of the wax paper. 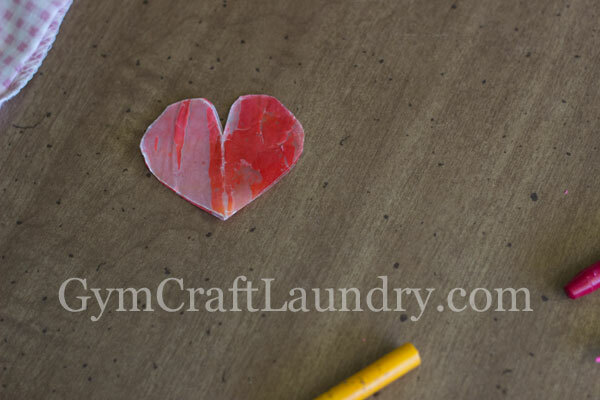 While the crayon is still warm cut the wax paper into hearts that are small enough to fit on the cards. I folded them and cut out hearts the same way I would if I was cutting out construction paper hearts. Grab the printed out cards that you set aside earlier. Place a wax paper heart face down on the cardstock. (If needed, re-melt the hearts under the towel again to make them soft and pliable.) 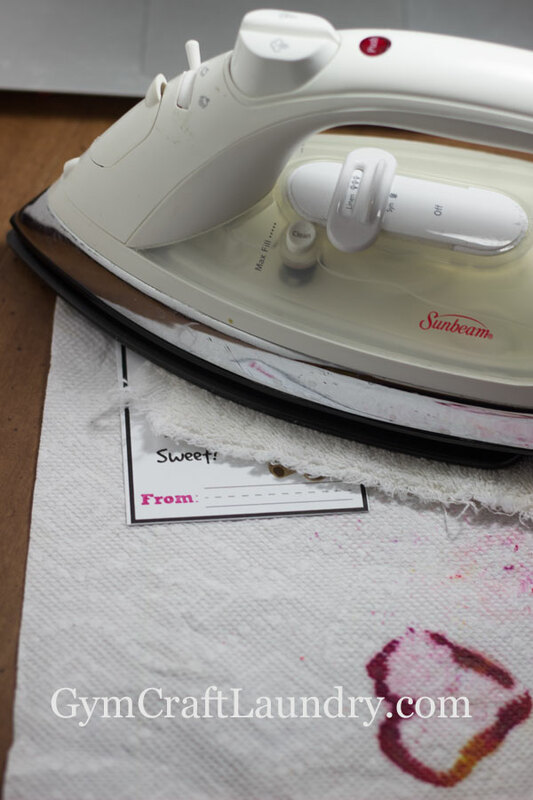 Put your towel over it and once again gently iron over the towel for about 10 seconds to “glue” the heart onto the card. Lift the towel and allow to cool. The melted crayon looks so vibrant on the card. I used a pencil to draw the balloon strings on the heart balloons. Let your child fill them out. The lines makes it much easier for little hands to write on the cards! If you must hand out candy with the cards a heart shaped lollipop or a balloon could be taped to the card. 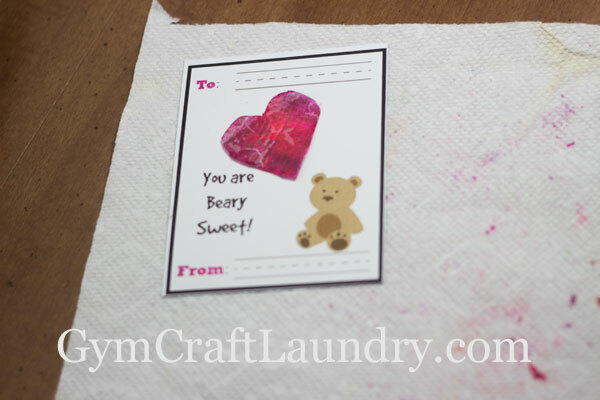 Be sure to check out our Preschool Valentine’s Day Cards. 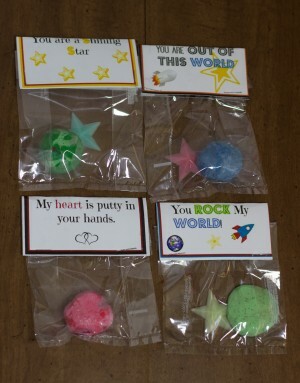 We also made These Bouncy Ball Space Valentines! Enjoy this tasty popcorn treat while you craft. How adorable!! I remember years ago making crayon art…it was always so much fun!! Pinned this! Echo recently posted…A Day In The Life of an Insomniac Mom of 4! These are adorable!! And we’re swimming in crayons. I’m adding this to our list of things to do this weekend! Rabia @TheLiebers recently posted…Hosting a House Party, Part Three: It’s Party Time! It was fun and pretty easy 🙂 let me know how it works out! So clever! I love making broken crayon art! I’ll share this none for sure! What a great idea! My daughter LOVES to break crayons and pull the paper off (seriously, she’s two and will sit there for, like, half an hour doing it), so this is the perfect craft for her! Mine daughter went through that phase too :/ now they just step on crayons all the time. I stock up on August when they are 50 cents a box! These are ADORABLE! I love the idea and the hands on factor! I saw your link to this post on the Thoughtful Spot Blog Hop. What a fun, fun idea. I agree — the hearts are very bright. I’m going to do this with my grandkids. Thanks so much for sharing. Thank you Nina! I love the look of melted wax! Starla J recently posted…Valentine’s Day date night on the cheap! Thanks Starla! Let me know how they turn out! wow! That is super creative! Lauren recently posted…Free Pantene Conditioner or Styler! I love these! I featured them in a roundup! Thanks! My husband wasn’t a nuke but he was a sonarman! Nice to meet you.